I think it’s fair to say Faith is a little owl crazy! She has owl wall stickers, blinds and cushions in her room, she has owl handbags and purses, an owl water bottle and lunch box and asked for an owl birthday cake this year. So it wasn’t a huge surprise when, the day before non-uniform day at school, she decided she wanted to wear an owl dress. Luckily, a while ago I bought some gorgeous owl fabric from Kitschy Coo, which Faith has been eyeing up ever since. So this was the perfect opportunity to use it! The fabric is a lightweight jersey that was fairly easy to work with and, according to Faith, really comfy to wear. The pattern is the trusty skater dress (also from Kitschy Coo), which has options for long and short sleeves, as well as the sleeveless version. If you don’t ignore your sewing teacher and take the time to pin, tack and sew so as to avoid nasty neckline issues, the dress sews up very quickly and the instructions are very easy to follow. Needless to say, the dress was a big hit. I hung it on her door before I went to bed and Faith appeared at 7am wearing the dress along with a very wide grin! Hello! I’ve just found your blog from MakeItLoveIt. Great title of your blog, and I am a fellow KitschyCoo fan. 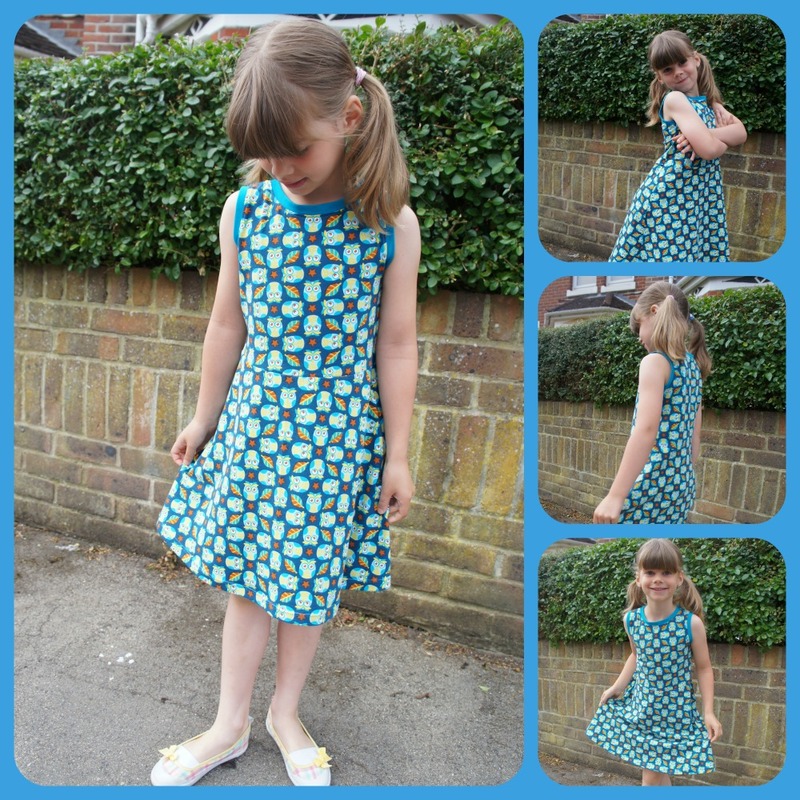 I have the Ladies Skater Dress pattern ready to go… just need to find the time to make it! Your daughter’s dress looks fab. This is so cute, and I love the fabric! I’m glad I found your blog, too, because I’d never heard of Kitschy Coo and I am excited to explore the fabric options!